(a) Using SST and a press, install a new front differential case rear tapered roller bearing (inner race) to the front differential case. Do not damage the front differential case rear tapered roller bearing (inner race) cage when installing the front differential case rear tapered roller bearing (inner race). Ensure that there is no clearance between the front differential case rear tapered roller bearing (inner race) and front differential case. (b) Using SST and a hammer, install a new front differential case rear tapered roller bearing (outer race) to the transaxle case sub-assembly. Ensure that there is no clearance between the front differential case rear tapered roller bearing (outer race) and transaxle case sub-assembly. (a) Using SST and a press, install a new front differential case front tapered roller bearing (inner race) to the front differential case. Do not damage the front differential case front tapered roller bearing (inner race) cage when installing the front differential case front tapered roller bearing (inner race). Ensure that there is no clearance between the front differential case front tapered roller bearing (inner race) and front differential case. (b) Install the shim to the transaxle housing. (c) Using SST and a hammer, install a new front differential case front tapered roller bearing (outer race) to the transaxle housing. Ensure that there is no clearance between the front differential case front tapered roller bearing (outer race), shim and transaxle housing. 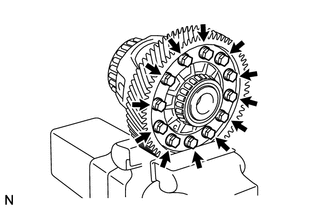 (a) Coat the front differential side gear, front No. 1 differential side gear thrust washer and conical spring with ATF. 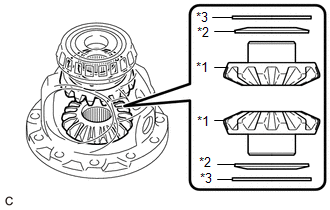 (b) Install the 2 front differential side gears, 2 front No. 1 differential side gear thrust washers and 2 conical springs to the front differential case. 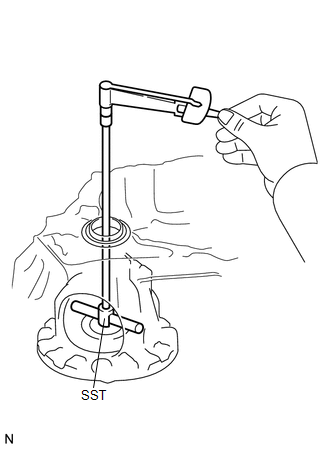 Make sure that the conical spring is installed with the correct orientation. 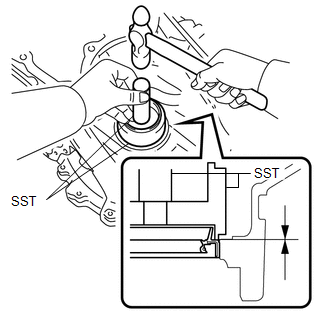 (c) Install SST as shown in the illustration and tighten it. 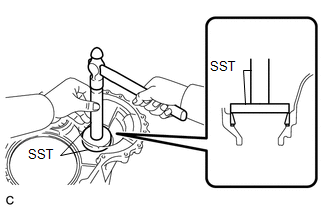 Do not overtighten SST as doing so will damage the front differential side gears, conical springs, front No. 1 differential side gear thrust washers and front differential case. Tighten SST to create the necessary clearance to install the front differential pinions. When installing the front differential pinions, do not overtighten SST, as it is necessary to rotate the front differential side gears. 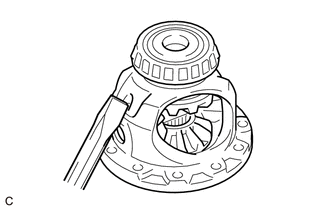 (d) Coat the front differential pinion and front differential pinion thrust washer with ATF. 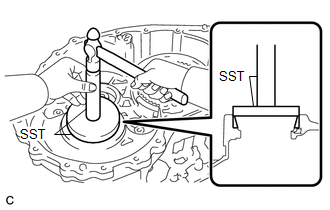 (e) Using SST as shown in the illustration, rotate the front differential side gear to install the 2 front differential pinions and 2 front differential pinion thrust washers. 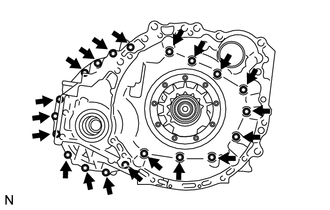 Be careful not to catch your fingers between the front differential pinion and front differential case. 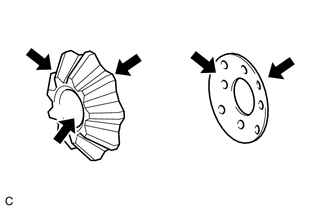 Do not drop the front differential pinion or front differential pinion thrust washer. (a) Coat the front No. 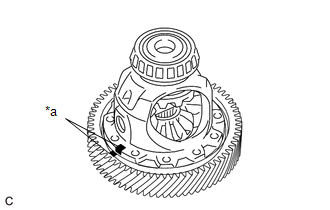 1 differential pinion shaft with ATF. (b) Install the front No. 1 differential pinion shaft to the front differential case so that the hole for the front differential pinion shaft straight pin is aligned with the hole in the front differential case. (a) Using a 5 mm pin punch and a hammer, install the front differential pinion shaft straight pin to the front differential case. (b) Using a chisel and hammer, stake the front differential case. (b) Install the front differential case to the transaxle case sub-assembly. (c) Install the transaxle housing to the transaxle case sub-assembly with the 20 bolts. 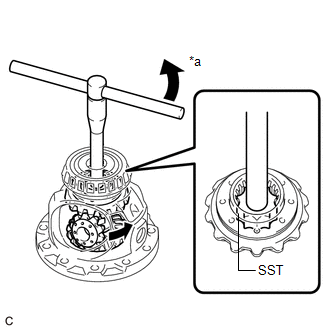 (d) Using SST, turn the front differential case right and left 2 or 3 times to settle the bearings. 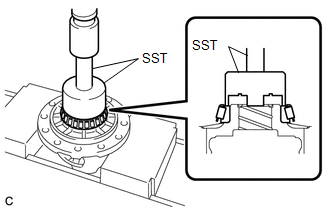 (e) Using SST and a torque wrench, measure the turning torque of the differential side bearing while rotating SST at 10 rpm. 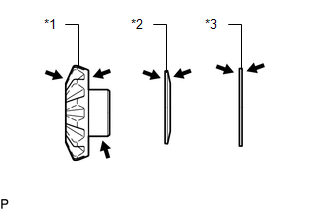 If the turning torque is not within the specified range, refer to the table below to select a shim so that the turning torque is within the specified range. (f) Remove the 20 bolts and transaxle housing from the transaxle case sub-assembly. 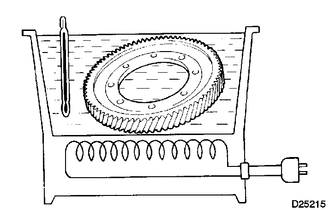 (a) Using ATF and a heater, heat the front differential ring gear to 90 to 110°C (194 to 230°F). Do not heat the front differential ring gear to more than 110°C (230°F). 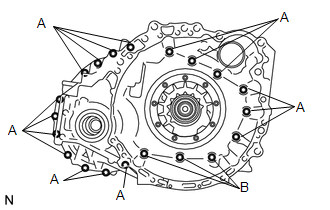 (b) Clean the contact surface of the front differential case. 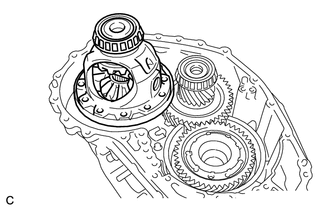 (c) Align the matchmarks, and install the front differential ring gear to the front differential case quickly. (d) Install the 12 bolts. 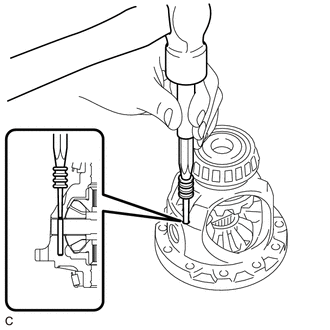 Tighten the bolts after the front differential ring gear has cooled down sufficiently. (a) Coat the lip of a new transaxle case oil seal with MP grease. 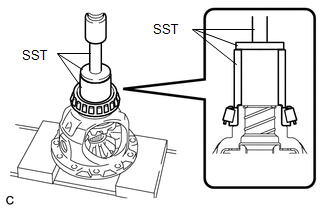 (b) Using SST and a hammer, install the transaxle case oil seal to the transaxle case sub-assembly. 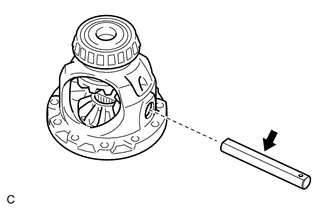 Make sure that the transaxle case oil seal is installed in the correct direction. Do not damage the lip of the transaxle case oil seal. (a) Coat the lip of a new front transaxle case oil seal with MP grease. 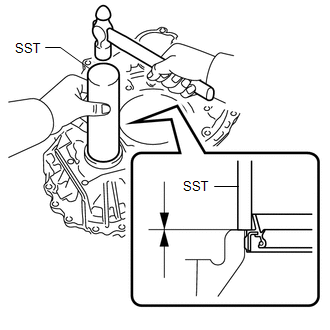 (b) Using SST and a hammer, install the front transaxle case oil seal to the transaxle housing. Make sure that the front transaxle case oil seal is installed in the correct direction. Do not damage the lip of the front transaxle case oil seal.